"Fun in this bounce house you will have," says Yoda. The front shows two people fighting with light sabers. 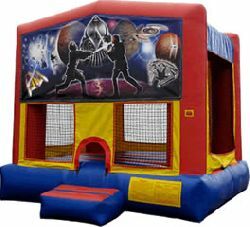 A great choice for a Star Wars bounce house theme. Note: This theme is also available in a jump & slide combo.